Full name of legal entity: Cotswold Clubhouse Limited, a limited company with registered number 11088172. Cotswold Clubhouse is registered, and operates, in the United Kingdom. We may need to update this Policy at any time and without notice and where we do this we will notify you by emailing our customers. This Policy was last updated on 21 May 2018. Financial Data means the data we use to process your payments for your orders including your bank details and payment card details. Profile Data includes your purchases or orders made by you, your interests, preferences, medical information relevant to the service and feedback. Where we need to collect personal data by law, or under the terms of a contract we have with you and you fail to provide that data when requested, we may not be able to perform the contract we have or are trying to enter into with you. In this case, we may have to cancel a service or product you have with us but we will notify you if this is the case at the time. Essential Service Providers: Sometimes, other businesses give us data about you which we may need for our legitimate interests of conducting business with you and on occasion they are necessary to perform our contract with you. It usually comprises Financial Data or Transaction Data. This happens when we link through to third party payment providers. 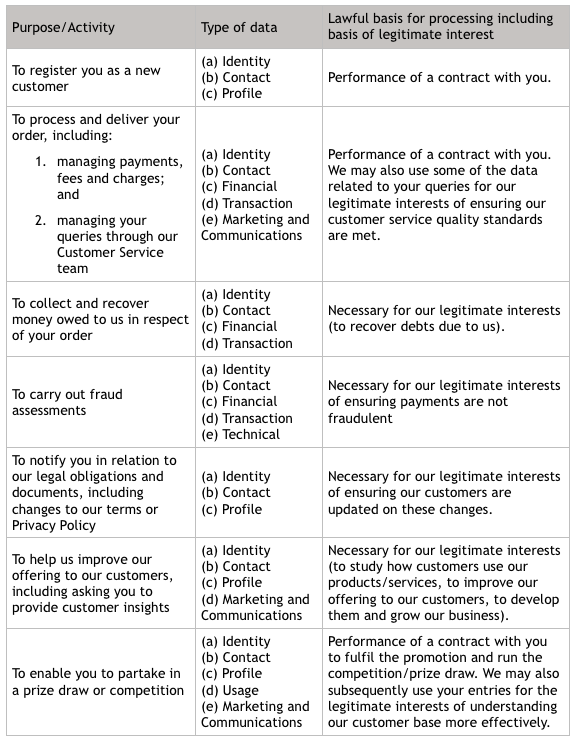 They tell us that you have paid for your products and, where relevant and/or necessary they will provide us with your Contact Data and Transaction Data. Generally we do not rely on consent as a legal basis for processing your personal data other than in relation to sending third party direct marketing communications to you via email or text message. You have the right to withdraw consent to marketing at any time by emailing admin@cotswoldclubhouse.co.uk. 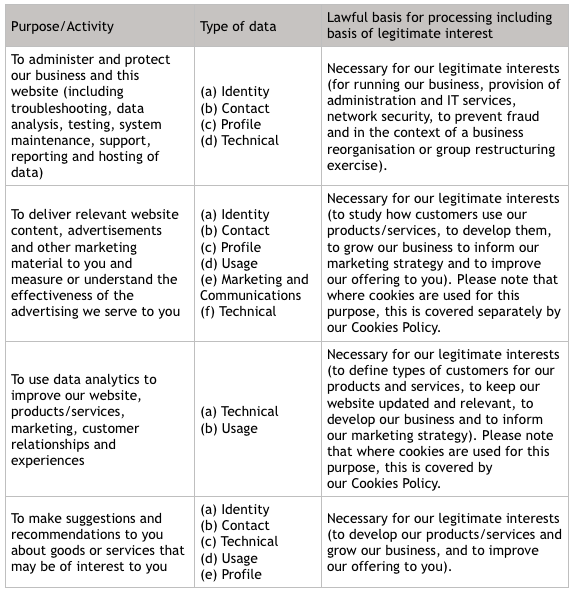 We may use your Identity, Contact, Technical, Usage and Profile Data to form a view on what we think you may want or need, or what may be of interest to you. This is how we decide which products, services and offers may be relevant for you. We only use the data you provide to us directly for this, we do not track what other websites you may visit after visiting our site, though in common with most websites, we may register the site which referred you to our site (e.g. a search engine). We generally only send electronic marketing – such as email marketing – to people who have previously bought similar products from us and this is in our legitimate interests. We will always offer a way out of receiving this marketing when you first purchase our products and in every marketing communication afterwards. We may on occasion send out postal marketing for the purpose of growing our sales which is in our legitimate interests and in this scenario we will rely on you to let us know if you do not want to receive this by opting out of marketing (see Opting out below). Where you have not previously bought from us but have registered your details with us (for example by entering a competition or signing up for a newsletter), we will only send you marketing communications if you opted into receiving marketing at the time and so given us your express consent (which you may withdraw at any time – see Opting out below). You can ask us to stop sending you marketing messages at any time by contacting us as admin@cotswoldclubhouse.co.uk or by following the opt-out links on any marketing message sent to you. Analytics tools – we use analytics tools to track the way that users interact with our website. Profiling tools – we use profiling tools to understand how you engage with our website and show you content we think will be most relevant to you, based on our understanding of your interests and preferences. By visiting this website with your browser settings adjusted to allow cookies, you are consenting to Cotswold Clubhouse using cookies for the purposes outlined below in order to provide you with a fully functional booking experience. Your browser accesses the cookie file only when you visit the website that generated it. This helps to ease your navigation. The list below details the cookies used on Cotswold Clubhouse. We have outlined who sets these cookies and their purpose. If the party reads something other than Cotswold Clubhouse, these are our third party business partners who help us to enhance your browsing experience. Persistent cookies are stored in your computer memory and are not deleted when the browser is closed. They are used to keep your preferences for the website, so they will be remembered for next time you visit the website. They are also used to collect information about the numbers of visitors, the average time spent on a particular page and analyse behaviour on the website. This information is used to find out how well the website works and where it can be improved. If cookies aren’t enabled on your computer, it will mean that your booking experience on our website will be limited to browsing and researching; you won’t be able to use all the website functionality. To enable and manage cookies, you can use your browser to do this. Each browser is different, so check the ‘Help’ menu of your particular browser (or your mobile phone’s handset manual) to learn how to change your cookie preferences.